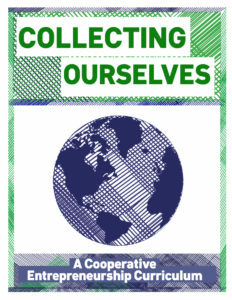 Collecting Ourselves: A Cooperative Entrepreneurship Curriculum was developed as the content of the trainings led by EMLC during her time directing the historically significant program, the Traveling Cooperative Institute. This book includes over a dozen hour of popular education workshops accessible to groups of adolescents to adults. The curriculum is open source – so, you can download it for free or buy a hard copy at cost, as well as share and amend freely as long as you do the same. EMLC will be releasing a publication outlining a traditional model of cooperative organizing iterated over the last few years for the Traveling Cooperative Institute – essentially, a “how to” guidebook for cooperative organizing.